I didn't think we'd ever need curtains. 2" aluminum binds should be enough to block the summer sun, so Hazel can get a good nap, right? 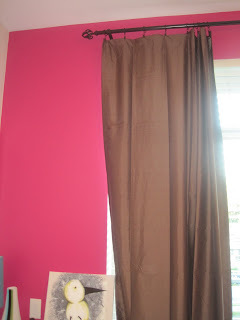 I guess not....We've been on the hunt for, what I've discovered, are the impossible curtains. -we want something fashionable that will grow with us. And, those demands are apparently too much to ask for. 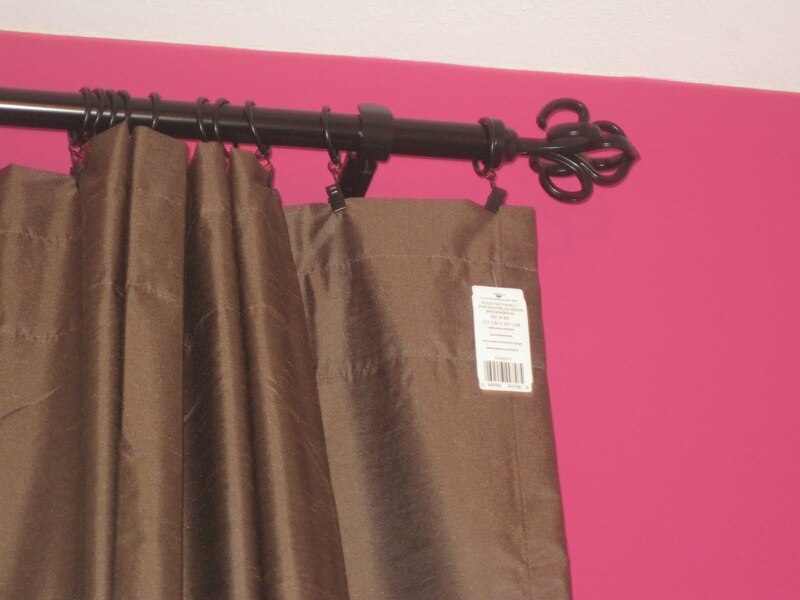 I managed to get these brown ones (pictured below for a steal), and so we're feeling out whether or not they really suit our living room. Brown probably wouldn't have been my first choice... at least not this shade. 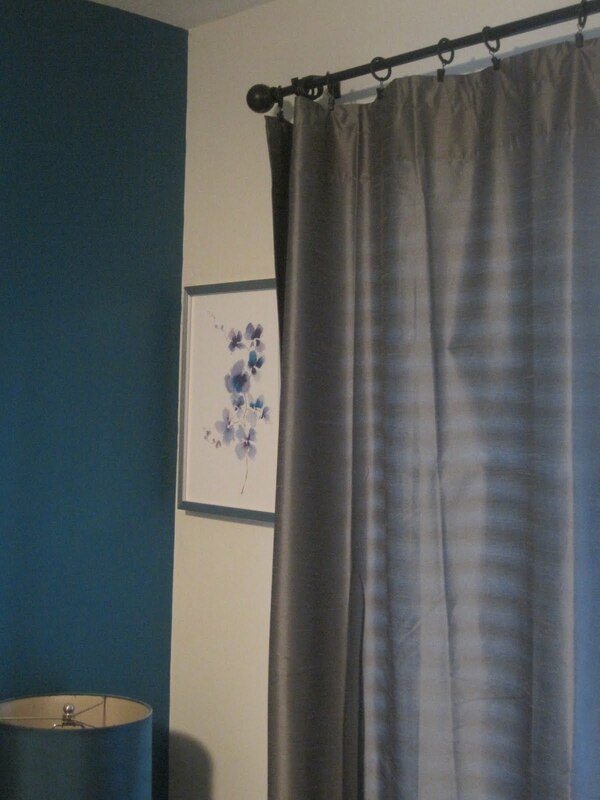 If the curtains were just a bit darker- more like a rich espresso shade- they'd go great. And so, the question is, do we keep searching, or learn to love these ones because I managed to get such a good price on them? I also managed to get the rod for uber-cheap (almost free! thanks to working at a hardware store that gives me in-store credit for every new credit card account I open with customers... so, 5 new accounts paid for this rod!). You'll also notice the price tag still hanging- I just don't quite have the heart yet to remove it- just in case. 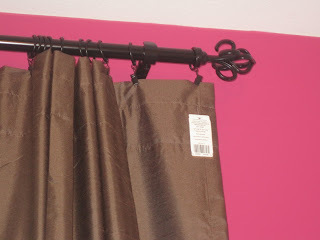 In this curtain journey, I have learned this: curtain rings are your friend! They completely eliminate the need for tie backs, and the look of them isn't nearly as bad as I thought it would be. Also, just when I thought our vaulted ceilings couldn't feel any higher- mounting the rod a few inches away from the ceiling added the illusion of at least 3 more feet to the room, making it feel even more grandeur and massive! Hooray! 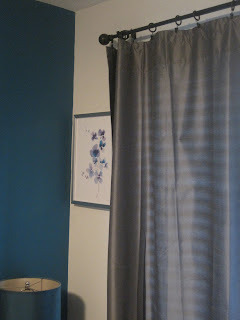 On the other hand, I picked up the same curtains in gray for our bedroom- and they look amazing! They have a metallic lustre and aren't quite as blackout as I hoped for in a bedroom, they're very chic and I quite enjoy them. Any opinions? Should we ditch the chocolate brown panels and keep searching? Or should I be bold and rip off those prices tags?